^ Karpenko, A.V. "The modernized Mi-8MSB (Ukraine)". Bastion-karpenko.ru. Retrieved 3 October 2016. 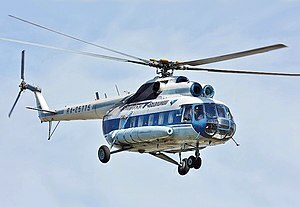 ^ "Motor Sich proposes Ukrainian Mi-8 MSB-V upgrades, new variants | IHS Jane's 360". Janes.com. Retrieved 3 October 2016. ^ a b c d e f g h i j k l m n o p q r s t u v w x y z aa ab ac ad ae af ag ah ai aj ak al am an ao ap aq ar as at au av aw ax ay az ba bb bc bd be bf "World Air Forces 2013" (PDF). Flightglobal Insight. 2013. Archived from the original (PDF) on 16 December 2012. Retrieved 20 March 2013. ^ "World's Air Forces 1987". p. 50. Retrieved 20 March 2013. ^ "World's Air Forces 1987". 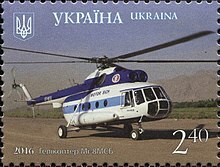 p. 86. Retrieved 20 March 2013. ^ MilAvia Press. "Order of Battle - Transnistria". Milaviapress.com. Retrieved 7 August 2017. ^ valerys (18 August 2007). "Tiraspol Flughafen". Panoramio.com. Retrieved 7 August 2017. ^ "World's Air Forces 1987". p. 67. Retrieved 20 March 2013. 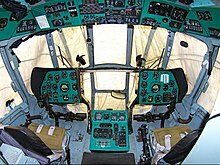 This page is based on the Wikipedia article Mil Mi-8; it is used under the Creative Commons Attribution-ShareAlike 3.0 Unported License (CC-BY-SA). You may redistribute it, verbatim or modified, providing that you comply with the terms of the CC-BY-SA.